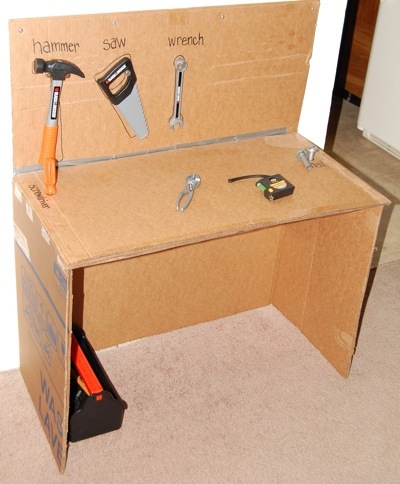 This is a great way to recycle a cardboard appliance box into a desk, workbench, or vanity for your toddler! 1.) Stand the box upright and decide how tall you want the desk to be; it should be at a comfortable standing height for your toddler. (My workbench is 22" tall.) Use a tape measure to mark your cut line all around the box. 2.) Cut along line with the box cutter. The larger top half will be the desk itself. Set aside the smaller bottom part, but don't discard it, as it will be used as reinforcement later. 3.) Cut the desk part of the box in half widthwise. 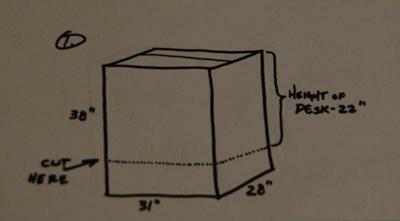 To do this, just measure the width of the box (in my example, it's 28" deep), and draw a cut line halfway around. You should have 2 parts that are exactly the same size. 4.) Apply wood glue to the inside of one of the halves, and more glue onto the outside of the other half (see diagram); put the two halves together to get a double-thick desk frame. Use clamps or staples (I used a medium-duty staple gun) to secure the 2 halves together upright until dry. (If you use staples, remember to remove them when the glue dries, or you'll get scratched from the exposed ends of the staples!) DO NOT lay the frame flat on the floor to dry, or the two layers may separate when you bend the cardboard into the desk shape. NOTE: In the diagram, the small side flaps at the top should be facing INward, not OUTward (I drew it wrong); see diagram of Step 6 to see how it's supposed to look. 5.) Remember the bottom part of the box from Step 2? Remove both bottom flaps from it, as well as both of the lengthwise sides. 6.) Glue the 2 bottom flaps together for the desktop. When the desk frame (from Step 4) is dry, thoroughly glue the desktop on top of the two side flaps (which should be facing inward). Clamp or weight it down until it's dry. 7.) Take the 2 lengthwise pieces (from Step 5) and glue them securely in an upright position to the back of the desk to reinforce the top flap and keep it upright. Workbench: Make tool holder pegs by drilling holes into the back board and securing 1.5" bolts with nuts. 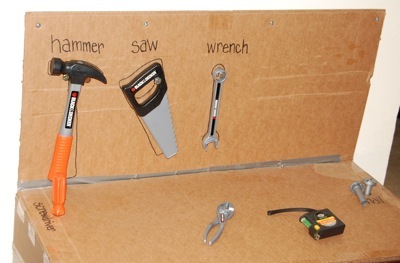 (To help a young toddler identify their tools, draw the outline of each tool around its peg, and write the name over where it goes.) To hold things like big plastic nails, screwdrivers, etc., drill appropriate-sized holes into the desktop. 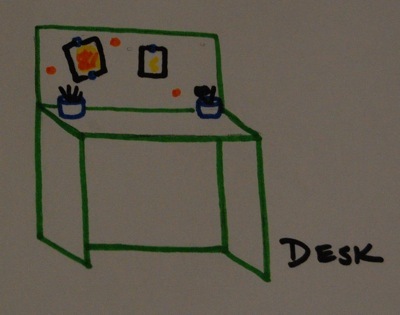 Desk: Glue 1 or 2 cups to the desktop to hold pencils, crayons, markers, etc. If your child is old enough, glue some corkboard to the back board, and use pushpins for your child to display their drawings. 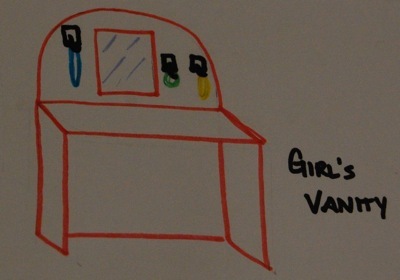 Vanity: Glue or hang a cheap mirror and a few of those "peel-and-stick" plastic hooks on the back board. (Both of those items can be found at almost any $1 store.) The hooks can be used to hold necklaces, bracelets, hats, scarves, and other dress-up accessories. This is a VERY sturdy design, and there are all sorts of variations you can come up with for your child. And the best part is, if they play with it until it falls apart... you can always make another one! The stuff for the babies is always made with delegacy. The babies are so innocent and soft, and are very elegant, therefore the stuff that should be for them must be so soft and elegant and of best type.